The first comic I bought regularly every month was Fantastic Four. I was basically using my allowance and birthday money for those issues. When I started working (as a golf course caddy when I was 12*) I was able to start buying more comics, and I began picking up Silver Surfer and The Punisher as those two titles had JUST started and I thought it was cool to get in on the ground floor. I was only nominally familiar with the Punisher at the time, but I also had this idea that it would give me some insight into the more "street level" aspects of the Marvel Universe that were certainly absent in FF and Surfer. Now, keep in mind that I'd only been collecting comics for maybe a year at this point. And I'm just barely aging into being a teenager. 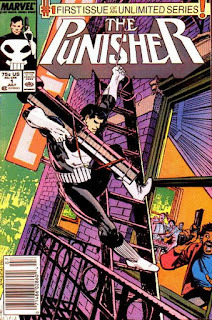 But after about a year and a half, maybe two years, I began to lose interest in the Punisher. Even with as little experience as I had at that point, I saw that there wasn't much character there and the stories were kind of repetitive. I kept buying it, though, for another two years or so because I still had that notion of trying to stay abreast of the non-cosmic side of the Marvel Universe. But in scanning back through those books, I don't recall much of anything past the first few issues. Every now and then, I'd catch some passing news item about the character, but I've generally continued to ignore him. Until yesterday. Jessica Plummer wrote this piece suggesting that, with all of the gun violence in the United States today, with an ongoing debate about enacting stronger gun laws, with mass shootings being a regular news item, maybe we should retire the glorifying-gun-violence Punisher. Like I said, I haven't really given the character much thought for many years, but she makes an excellent point. Almost regardless of how he's portrayed, he almost inevitably leaves behind a spray of bullet casings and a pile of dead bodies in his wake. And while there's an argument to be made that he could be used as a conduit to a discussion about gun violence, history has long since proven that's just not going to happen. I don't want to really get into the politics of the gun debate, but to lay my cards on the table, while I was completely behind the first amendment for most of my life, about five years ago, I started pivoting to the conclusion that there is simply no reason to have guns legal in the US. At all. Not even for police. And in that light, I have to say that I think Plummer has a fantastic idea. There are an insane amount of stories in pop culture that resolve issues with guns. But few routinely glorify the deaths of human beings at the hands of them in the way Punisher does. Maybe it's time to put that concept up for reconsideration. What do you say, Marvel? * A) It wasn't nearly as fun as Caddyshack would imply. B) I'm pretty sure there were some child labor laws being broken. They did ask how old I was, and I lied by saying 13, but the guy who hired me said that if anyone else asks, I should lie and say 14.